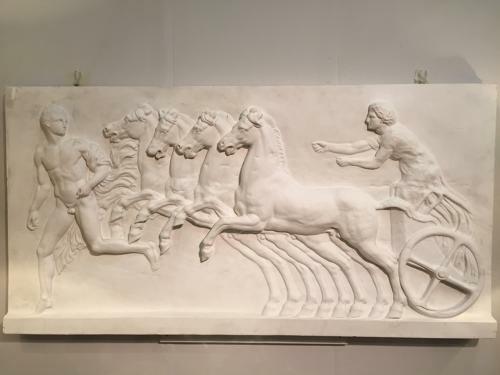 A good size plaster relief plaque depicting a Roman charioteer with four horse drawn chariot chasing a running man. Late C20th. Such plaques were often tourist pieces sold after visiting such places of Roman historic interest in mainly Italy such as Rome and Naples as well as important archaeological sites or museums. Copies or moulds were often directly made from the original most likely marble or stone carving. Fantastic artistic movement particularly of the four horses - breathing life into the piece, keeping the viewers eye engaged with the subject.